An architect’s rendering of the redesigned cafeteria at Niagara Falls Memorial Medical Center, now more of a café/bistro. NIAGARA FALLS – Staff and visitors at Niagara Falls Memorial Medical Center will have a revamped place to eat later this year with an emphasis on fresh, farm-to-table foods. 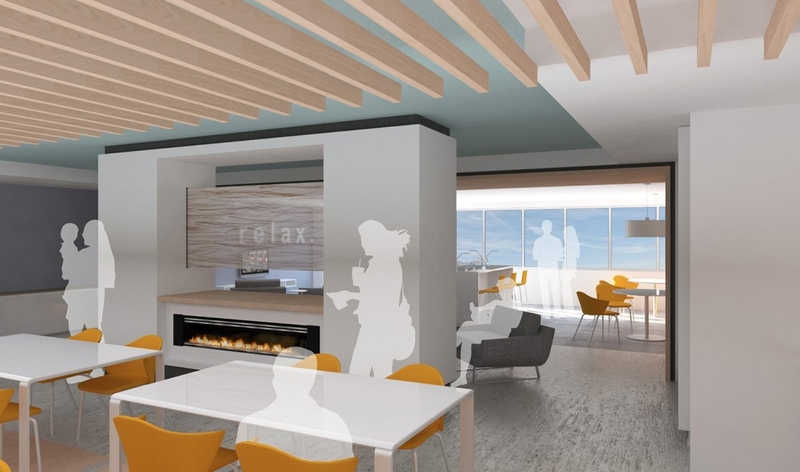 Niagara University’s hospitality students helped to develop the plans for the reformulated facility, which is being billed as a more modern café/bistro. The project is the result of a new partnership between the hospital and the university. The hospital will update the menu and “dining experience” for those who use it, said Michael A. Mistriner of Cannon Design, the project architect. The 3,500-square-foot space will have a “Starbucks-like” section including a Wi-Fi bar, fireplace, large-screen televisions, couches and club seating, along with an area of more traditional seating, Mistriner said. There will be a wood-fired pizza oven, a more robust salad bar and possibly an area for the preparation of stir-fried food. Other types of food also will be available, including burgers, paninis, wraps, as well as a “grab and go” area with premade sandwiches along with fruit and yogurt. Vending machines will remain but will be better incorporated into the facility’s design, Mistriner said. At least part of the facility will be accessible 24 hours a day. Construction on the project is expected to start in the spring and cost between $350,000 and $400,000, with it wrapping up in the late fall. Joseph A. Ruffolo, the hospital’s president and chief executive officer, said the hospital is shooting for a “wow factor” in its effort. He referred to the yet-to-be-named dining facility as a café/bistro. “We’ll come up with a better name later,” Ruffolo said. Another element of the partnership between Memorial and the university is customer-service training for hospital staff. Some of the hospital’s funding is based on scores the facility receives in patient-satisfaction surveys, based primarily on customer service, Ruffolo said. Hospital officials said they want to improve those scores. Also, as part of the partnership, Niagara University students will have increased internship opportunities at the hospital, including in emerging health care jobs such as care coordinators and care managers.